typical teenager" hadn't yet become well enough known to spawn imitators — more like a female Harold Teen, but with just a touch of Ella Cinders thrown in. Aggie's comic strip was distributed by The Chicago Tribune Syndicate (whose other female stars range from Winnie Winkle to Broom Hilda), starting in 1946. Aggie (full first name, Agnes) was in her early teens, and stuck in a less-than-ideal home life. She was being raised by her father's second wife, who showed a clear preference for her own daughter, Mona, a couple of years older than Aggie. Dad was seldom seen, tho he did support the family from afar. Aggie's only friend at home was Whiskers, a stray dog she adopted early on — who, of course, was hated by the rest of the family. and her family situation never reached the point of out-and-out slavery to her step-mother and step-sister, tho her friends did sometimes remark on the unfairness of it all. Even at that, it gradually eased up as the series progressed. It never quite went away, but the Archie-like aspects dominated more as time went on. 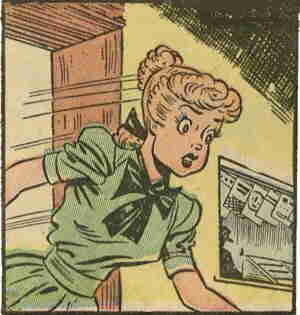 Aggie was adapted into comic book form by Superior Comics, which, under various names, did the same with Brenda Starr and Bruce Gentry. Eight issues came out, between January, 1948, and August, 1949. Dell Comics took a shot at adapting her into that medium in a 1962 issue of Four Color Comics (where they did everything from Alley Oop to Zorro). But there were no radio shows, movies, TV series, Big Little Books etc. Like many syndicated comics, Aggie appeared overseas. But she was especially popular in France, where she started in 1947. There, the strip's name was Fillettes. An all-French version, done by cartoonist Gérard Alexandre, started in 1960. Back in America, the strip was handled by Rasmussen until his death in 1962. After that, it was taken over by Roy L. Fox, whose earlier credits mostly include magazine cartoons. In 1966, the title was shortened to Aggie. Fox handled the strip until it ended, but there's a minor discrepancy about that. Some sources say it ended in 1970, but most say '71. In fact, however, a few episodes are known to have appeared during the first week or two of 1972. In any case, it's been gone for decades. But not forgotten! Despite the fact that it's no longer published, Aggie Mack is still merchandised. Even today, die-hard fans can still buy T-shirts, coffee mugs etc. with her licensed image. Text ©2006-07 Donald D. Markstein. Art © Tribune Media Services.